I was up bright and early to to get all the bits needed to make some cup cakes. 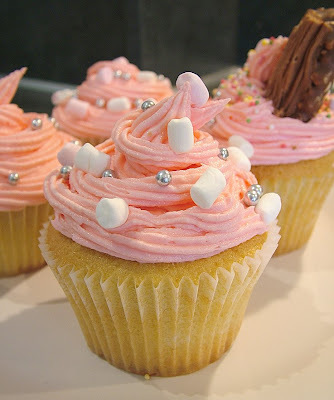 I have been looking longingly at some of the cup cakes people make and have been dying to have a go! I went along to my local market to buy a piping bag and other bits and the man on the cook wear stall said they are also opening a shop dedicated to cake making, so I'm very excited about that! 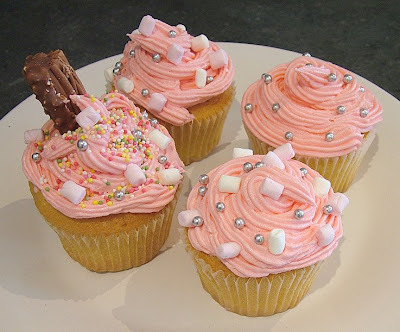 For these I followed Laura Sparling's recipe for Vanilla Cup cakes and made up my own design for the toppings! 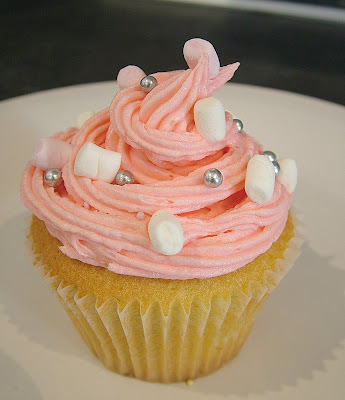 Of course the frosting had to be bright pink! I'm fairly pleased with the results! Wow they look ace! You did very well for the first attempt. Can i eat them now? Wahey! They are fabulous, Janine!